A passing celestial being is trapped by earth’s gravity and dragged reluctantly to its surface in the middle of a Moscow winter. Stranded in the body of a dog the alien being is forced to intervene in the early Russian Space program in order to get a ride home. 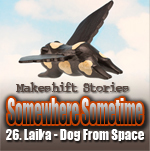 The story is loosely based on the Sputnik 2 mission that carried a dog named Laika into space on November 3, 1957.